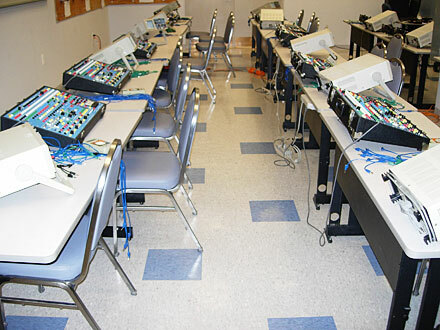 Each lab consists of 20 stations with an electronic breadboard trainer, ocilloscope, and digital multimeter at each station. The electronic trainers have built in resistors, capacitors, inductors, SCRs, UJTs, as well as a DC and AC voltage supply. While in this lab, apprentices review the DC and AC theories.